England netted three during a stunning opening 45 minutes in Seville. A trio of first half goals from Raheem Sterling (two) and Marcus Rashford sent shockwaves around Europe as England moved within two points of Spain in their UEFA Nations League group. The youngest English starting eleven since the turn of the century were looking to overturn a Spanish side undefeated at home for 15 years and 38 games - albeit they were aiming to maintain that record in Betis' Estadio Benito Villamarin, hosting international football for the first time since 1995. On a soggy Seville evening, Spain started with the majority of possession as anticipated. Raheem Sterling, already looking like he would be forced into a more defensive role than desired, lost the ball on his first flourish forward, allowing Jonny to put the away defence under pressure. The Wolves full-back won a corner with the resulting set-piece falling at the feet of Thiago who fired a deflected effort wide. Yet that early spell sparked the hosts into life and they formulated the first real chance just moments later as Marcos Alonso fired a ferocious volley goalbound - luckily for England, Jordan Pickford's head was in the right place at the right time, diverting the effort off-target. Kieran Trippier was finding himself with a lot of early defensive work to do and a weak header fell at the feet of Marco Asensio but the Real Madrid star could not develop any real purchase with his strike to test Pickford. The visitors were on the ropes. However, England held firm against the early onslaught and stunned the hosts on 16 minutes completely against the run of play. Marcus Rashford delivered a sublime threaded pass to Sterling, tight on the shoulder of the last man, and his pace took him clear before firing a rocket into the top corner past David De Gea - his first away goal for his country. Spain looked to respond immediately but Asensio took on a wayward strike from the angle rather than picking out a waiting teammate in the penalty area. Yet it was that left side that Luis Enrique's men were looking to exploit again. However, the dynamics of the contest had changed - a drop in tempo from the hosts despite a flurry of fancy tricks and flicks in midfield were not reaping reward...and they were soon stunned again. A Thiago effort from range was comfortably captured by Pickford before he released a quick long ball up to Harry Kane. 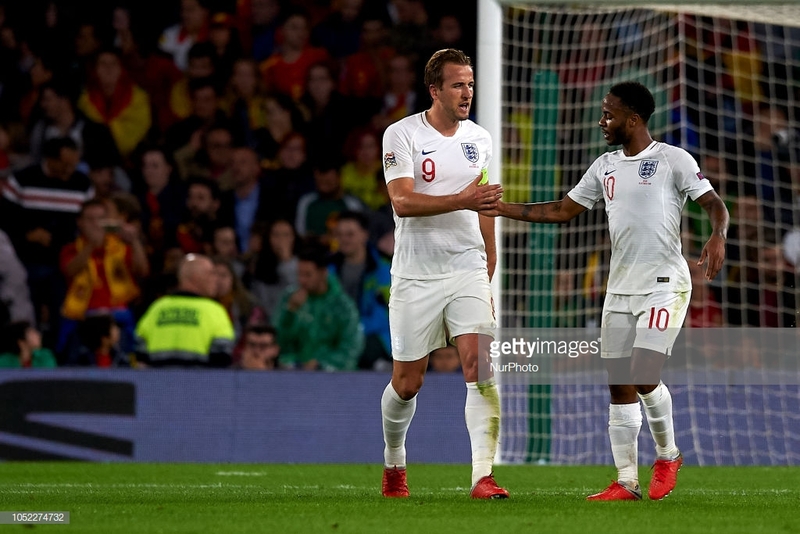 The England captain showed excellent strength to hold the ball up before releasing Rashford, skipping past the offside trap as Sterling did earlier in the half. The Manchester United man held his nerve and slotted past clubmate De Gea to double England's lead on 30 minutes. Eric Dier chipped a delightful pass into the path of Kane who stretched out a big toe to feed Sterling. The 23-year old found himself unmarked before tapping home a third for the underdogs - a trio of goals formulated by England springing the offside trap through the channels. There was no doubting Spain would come out fired up as the fear of another high-profile disappointment loomed large just months after their early World Cup exit. Saul Niguez showed excellent aerial footwork to get the ball under his spell but fired a difficult technical effort over the crossbar. Moments later, Asensio turned in the box only for Joe Gomez to get enough of a deflection to divert the ball inches wide. Saul was getting more involved offensively and found some space on the edge of the area before driving a daisy-cutter into the grasp of Pickford. Yet that was his last action as both he and Iago Aspas were axed before the hour mark in what was to be a shrewd move by Enrique. Eyebrows were raised when Paco Alcacer was left on the bench after scoring goals galore this season but he was thrown into the cauldron after netting a double against Wales on Thursday. The striker immediately found space away from Kane at a Spanish corner and flicked a delightful header past Pickford with his first touch of the contest. Game on. All of a sudden the tension was palpable for the men in white shirts and they almost gifted Spain further hope. Pickford took one too many touches as Rodrigo stole the ball off him before the World Cup hero somehow recovered to poke the danger away - cue volatile Spanish protests as it appeared the striker was hauled back by his opponent. However, that moment of controversy and the resulting arguments seemed to help England slow the tempo and take a breather. Alonso fired a free-kick over but the ticking of the clock was beginning to look more favourable for England. Yet the visitors continued to drop deeper and deeper. You could sense the desperation with the nature of their clearances in defence but Spain just could not find the adequate quality with their final ball. Meanwhile, Alcacer struck a curling effort into the arms of Pickford before Thiago cut an effort wide from range. When England's number one was beaten from distance, Asensio saw his effort slam just inches past the post. England were beginning to believe and that feeling grew stronger with five minutes left to play as another moment of fortune went in their favour. Asensio's drive was palmed against substitute Alvaro Morata but the ball bounced off him and wide, synonymous with his club form since arriving in the Premier League. Spain continued to probe as seven minutes injury time was shown but Alcacer could only head over when they finally manufactured an opportunity in the penalty area. Yet they were getting closer and Alonso hit the crossbar from a header with seconds left. Eventually the hosts did get their reward just moments later as Sergio Ramos headed home with the last touch of the game to conclude an electric contest - 90 minutes that underpinned the reason why the Nations League was introduced...competitive international football on a regular basis.